That seemed like a reasonable analysis on my part. 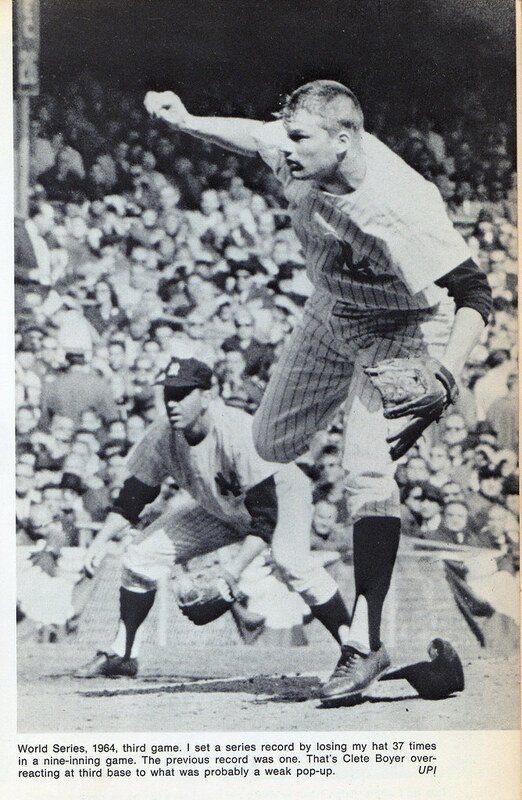 After all, there have been several pitchers over the years who haven’t even been able to keep their caps on their heads, including Mike MacDougal, John Pacella, and Jim Bouton. And a cap fits more snugly than a helmet would, right? Not only that, but the team is called the Hardhats! You can see a bunch of additional photos of them here. Uni Watch: First tell me a bit about yourself. How long have you been the head coach of Post 22? Mitch Messer: I’m entering my fourth season as head coach. UW: Did you play for Post 22 when you were younger? UW: Had the team already started wearing the helmets when you played for them? MM: Oh, yeah. The team started wearing hardhats back in 1964 or ’65. UW: Oh, wow. Fifty years! UW: How did that start? What’s the story behind it? MM: The coach prior to me was there for 47 years. His name was Dave Ploof. 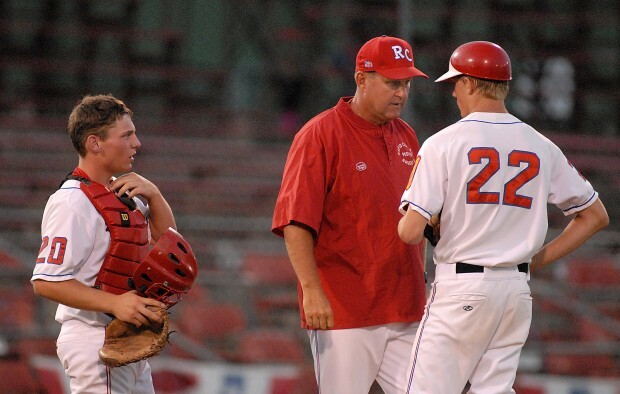 He’s the winningest coach in American Legion history. He started the hardhat tradition. My understanding is that it was originally for player safety. The pitchers started wearing it, and then everyone else on the field started doing it too. UW: Was there a specific incident that prompted this? Like, was a player hit in the head by a line drive or something? MM: No, I’m not aware of any one incident. I think it was just a safety concern. And I know over the years it’s saved a lot of our players, just in the short time I’ve been involved with the program. UW: When you played, which position did you play? UW: And was it weird wearing a helmet in the outfield? MM: Maybe the first couple of times you put it on, but then you get used to it and it becomes like any other piece of equipment that’s part of you. It’s not that big of a deal. UW: The team is called the Hardhats. Was there another team name before everyone started wearing the helmets? MM: Just like every other American Legion team, we were just known by our post number. The “Hardhat” name came about because the local paper and news would always call us that, and it just kinda stuck. UW: Are these essentially the same helmets worn by Major League first and third base coaches? In other words, are they the same protective quality as batting helmets, only without the earflaps? MM: Yeah. We call ’em “skullies” [short for “skullcaps” ”” PL]. Same thing catchers wore before the new hockey-style masks. UW: What brand are they — Rawlings, or Easton, or something else? MM: That’s tricky. We have a contract with Under Armour, so everything we wear from the shoulders down is Under Armour. But for our skullies, we wear Easton, because Under Armour doesn’t offer a skully. UW: Do any of the players ever have trouble with the helmets falling off? I’m thinking specifically of pitchers, because the pitching motion can sometimes involve a sort of violent jerking motion of the head. UW: Has anyone ever had to wear a chinstrap or come up with some other method of keeping the helmet on? MM [laughing]: No. But here’s something: We used to wear Rawlings helmets. And those were okay. They had, like, a leather interior. I’d say those fell off more often than the Easton product we have now. It’s a big difference — they’re really comfortable, and they stay on. UW: Is it the interior padding? Like, does it mold to your head better, for a snugger fit? MM: Yeah, I think so. It’s the same thing they use for their bike helmets. UW: Do you have any issues with the helmets being too heavy, or too hot? MM: The old ones, yes. But these new Easton ones have vents in the top and they’re really nice. UW: When you get new players, do they already know all about the helmets? In other words, do they know what they’re getting into when they join the team? MM: Yeah. Here’s a quick snapshot of the program: We’ve won 39 state championships, we’ve had a national championship, we’ve been to the American Legion World Series eight times. We have 1,600 season ticketholders here. So as a little kid — myself included — you come to these games and you dream of wearing the hardhat. Growing up, that was cool. That was like, man, the day you get the hardhat, that means you made it. We have three younger-level teams, and they don’t wear the helmets. Only the varsity team. UW: So you have to earn your helmet, so to speak? UW: I can see the psychological or motivational value in that. But if this is about safety, why wouldn’t you want the younger teams wearing the helmets too? MM: Right, right. I’m just tellin’ ya, in the 1960s it was probably more about safety. Today it’s more about tradition. UW: Do opposing players or fans ever razz your players about the helmets? MM: Only when we’re playing someone who we’ve never played before. But most of the teams we play know about us and know about the hardhats, so it’s not that big of a deal. UW: Has any team ever tried to copy you and worn their own helmets in the field? MM: Yes. There’s a Legion in Missoula, Montana, and I know they’ve messed around with the hardhat concept. UW: And how did you feel about that? UW: But it’s sort of a tribute, or an implicit compliment. MM: It is, it is. And I saw that part of it too. I get it. I don’t know. But if you wear it and it means something to you growing up, it’s a little bit different. UW: Is it a hassle to travel with so many helmets? MM: No. Each kid gets his own and they just throw it in their bag. UW: What about budgetary issues? Helmets must be a lot more expensive than caps, right? MM: Not really. I think an Under Armour hat is $18, and we get the hardhats for $23. UW: Oh, wow — that’s a lot less than I would’ve guessed. Do you even bother to issue caps to the players? Like, they’re never going to have any reason to wear them, right? MM: They wear caps for pregame. They don’t put on their hardhats until after pregame. UW: Judging from the photos I’ve seen, you and your fellow coaches wear regular caps. Have you considered wearing helmets as a form of solidarity with your players? MM: Well, we have to wear the hardhats when we’re coaching on the bases. UW: Yeah, but when you’re in the dugout, or when your team is in the field. MM: Yeah, then you can wear a regular hat. UW: How often do the helmets actually come into play? Like, have you had any players get hit on the head by a line drive? MM: Not too often, but it does happen. I remember when I was playing we had a centerfielder who dove for a ball and it went off his glove and then ricocheted off his hardhat and went all the way to the fence. So in that case it ended up working against us. MM: Yeah, I guess. To me, a helmet is something with earflaps. UW: Fair enough! I think that’s all the questions I have. Anything to add? MM: No, I think that pretty much covered it. We get asked about the hardhats all the time. UW: Yeah, I figured. I actually feel kind of foolish for not having known about you guys until now. This is my beat, covering uniforms and equipment, and I’d never heard of you until today. Especially when you’ve been doing this for 50 years! MM [laughing]: Well, we’re in South Dakota! I mean, come on. Meanwhile: If Post 22’s pitchers can wear helmets, why can’t MLB pitchers? There’s been so much research and development regarding padded caps, but I’m now in the camp that thinks a helmet would make more sense. Design contest reminder: In case you missed it, I’m currently running a contest, with a cash prize, to design a Uni Watch smart phone case. Full details here. As an aside, many of the designs that have been submitted so far feature a white background. As you can see, I used a white background for the mock-up shown at right, so maybe people were following my lead, but I want to stress that the base color does not have to be white. If you go to this page and click on “Layout,” you’ll find a link that will show all of the available background colors. Baseball News: The A’s and Astros went yellow vs. orange yesterday. ”¦ Here’s your chance to vote on the best high school baseball cap in northeast Ohio (from David Feigenbaum). ”¦ Nice striped stirrups for North Dakota pitcher Zach Muckenhirn. ”¦ The Richmond Flying Squirrels — that’s the Giants’ double-A affiliate — will be giving away replica Giants championship rings on Tuesday (from Tommy Turner). ”¦ With the Mariners wearing their gold/royal alts yesterday, the team logo behind home plate was rendered in those colors. But Mike Zunino’s catching gear showed the team’s primary colors (from Jim Shemaria and Ethan Allen, respectively). 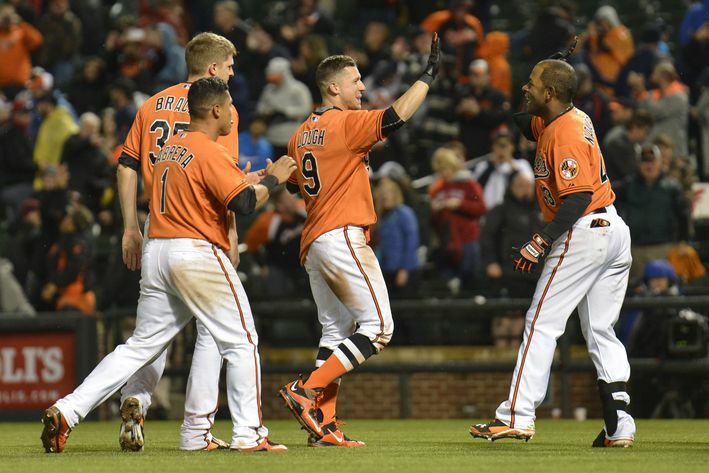 ”¦ More and more Orioles are wearing those 1960s-style stirrups (from Andrew Cosentino). ”¦ College of Charleston wore some seriously old-timey throwbacks the other day (from Colin Monahan). ”¦ The Rockies were rained out yesterday. 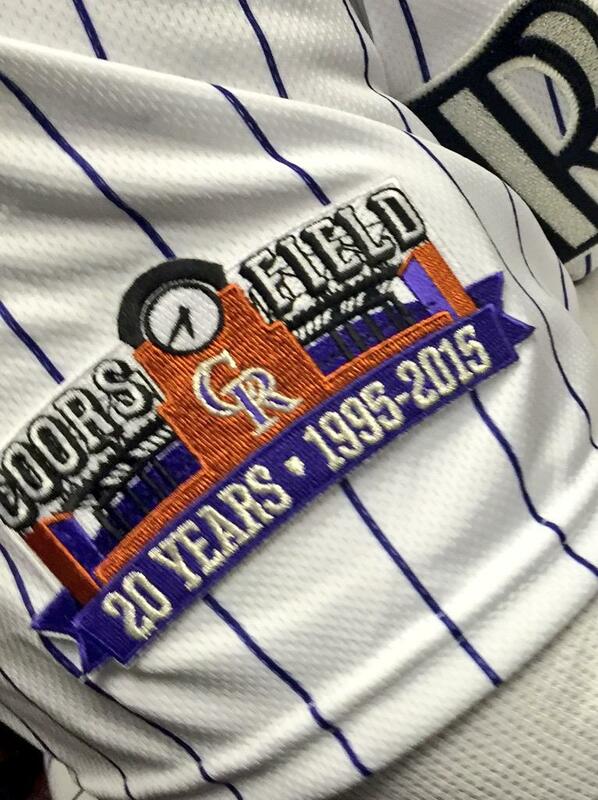 But if they had played, they would have worn this sleeve patch celebrating the 20th anniversary of the first game at Coors Field (from Tyler Maun). ”¦ New uniforms for the Pensacola Blue Wahoos, who may be the only pro team that wears pink as a regular thing, not for special causes. Grab Bag: Looks like Mike Ditka’s chinstrap offered more protection than his facemask (nice photo find by Douglas Ford). … Here’s a compilation of Australian surf lifesaving club cap colors. “When a surf carnival is held on an Australian beach, competitors in the various events wear these cloth skullcaps so spectators can identify which club they represent,” explains Graham Clayton. ”¦ With marijuana now legal in Colorado, there’s now something called the Colorado Cannabis Chamber of Commerce, whose logo has ruffled some feathers. Kudos on a great interview! Messer comes across as a swell guy indeed. If Post 22’s pitchers can wear helmets, why can’t MLB pitchers? There’s been so much research and development regarding padded caps, but I’m now in the camp that thinks a helmet would make more sense. I’m leaning towards that camp as well. It would look less “goofy” than the padded caps. That shouldn’t mean anything, but unfortunately it does. Fortuanately Alex Torres has ignored all the “fun” being made of him, but I’m sure a lot of players have shied away from padded caps or “Great Gazoo” helmets. There are enough things in the world to joke about…hopefully people will lay off jokes where safety is an issue. I’m sure you are aware that the ’53 Pirates started the season wearing helmets at bat and in the field (including pitchers). The reason I see most for them abandoning helmets on defense was the weight and awkward feel of the helmet. I would think the flocking added to the weight. With today’s lighter helmets I would think a pitcher could pitch with one (particularly the flapless “Cool-Flo” helmets some of the base coaches are wearing). This Legion team example shows this. My only concern would be if the sudden motion of a pitcher moving to protect himself from a line drive might knock the helmet off (or out of its proper alignment) before it can do its job. Also, the Cool-Flos don’t protect as well as the S100s, so there is still a comfort/protection trade off (although a Cool-Flo would offer much more protection than a cloth cap). No,I think the reason the 1953 Pirates stopped wearing helmets in the field was it wasn’t needed. This is the classic case of a solution in search of a problem. 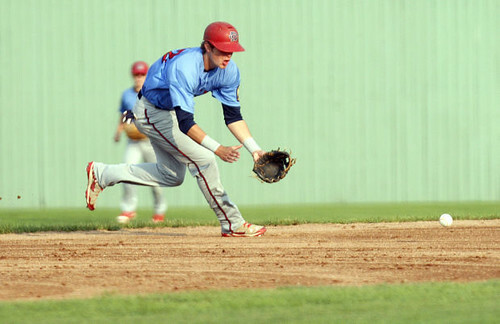 Infielders almost never get hit in the head for two basic reasons. They are further from the plate than pitchers, and are in a much better defensive position. Helmets still come in handy, though. I’m thinking of guys who lose the ball in the sun, for example. As for baserunning, once earflaps became the standard, I would have requested a double flapper, even though I only bat lefty. If you’re trying to beat out a bunt attempt, it would be nice to have that other ear covered if the catcher’s throw to first got too close. But then I’m the guy who thinks kids should play with a tennis ball until you get to high school age, so I’m a little cautious. Except that a falling ball – as when you’ve lost it in the sun – isn’t actually very dangerous. A fly ball will typically have a velocity of not more than 96 feet per second when it reaches an infielder, or less than 65 mph. A batted ball can easily exceed 90 mph. That’s the difference between being hit by a little-league pitch and being hit by a Stephen Strasburg fastball. Great interview. Is this the shortest ticker in blog history on a non vacation/holiday/off day? WOW. Not many Ticker submissions + I was traveling all weekend = short Ticker. 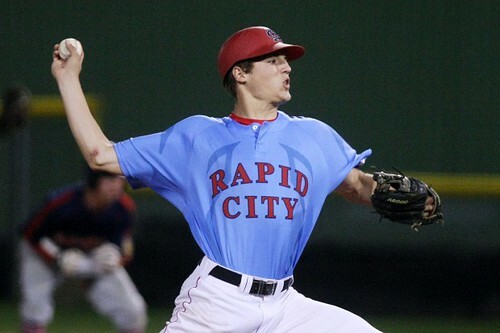 Those Rapid City unis look sharp. Slightly O/T: Do American Legion uniforms come from a few templates, or does a team get to flex its design muscles if it wishes? Plus, am I the only one hoping that that aesthetic taste catches on with “kids these days”*, i.e. young baseball players? 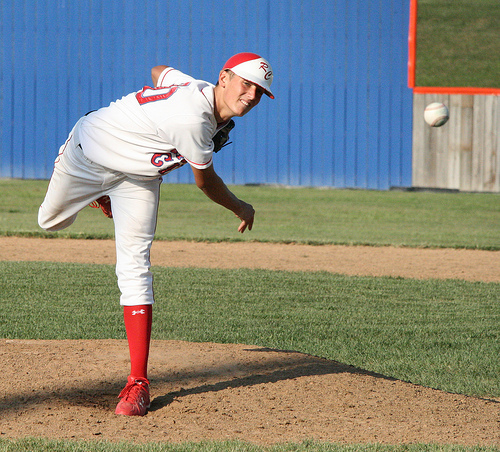 As far as I know, American Legion teams can choose any uniform template they want. Most, do however, stick with the red, white, and blue color scheme. I did coach for Post 308 in Oakwood, GA for a couple of years whose colors were teal, white, and orange (head coach was a Dolphins fan). In the fourth picture, were the two teams playing distinguished by their pants color? It’s look like they Jorge had on white jerseys, and red vs. black pants. LOVED the interview, Paul. Fascinating and a great line of questions. Nice work! Thanks! I’m happy with the way this one turned out too. Agreed – fantastic interview. This one will definitely make the 2015 UW highlight reel. The killer detail for me: An American Legion team has 1600 season ticket holders. That would be impressive at most levels of pro minor-league ball! 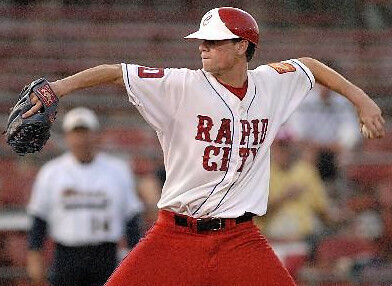 No minor league team very close to Rapid. Sioux Falls might be the closest now that Casper Ghosts have gone under. As a former umpire out in the Rapid City area and covering most of the summer games for Coach Messer and the Post 22 program I can provide first-hand knowledge that this is a stand-up program. Their motto is Tradition of Excellence and everything is done very professionally. From arguably the nicest field and South Dakota if not the 5 state area, the jerseys, the exceptional coaching, and the hard hats. 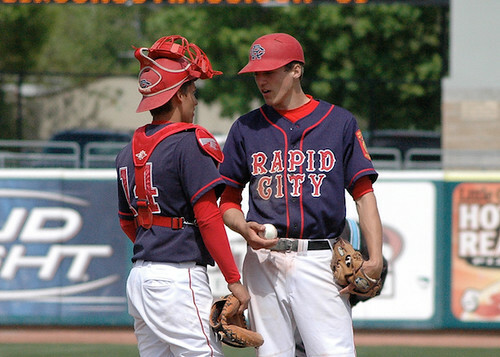 I umpired in Rapid City for 6 years and have nothing but great things to say about the program. And yes, they easily pack in 1600 fans on most nights during their “Firecracker Tournament” where legion teams from all over the US come to play during the 4th of July week. Other than vanity and lack of “coolness” (i.e flat brimmers), what other reasons would MLB pitchers have for not wearing a helmet on the mound? And it was a very interesting interview. 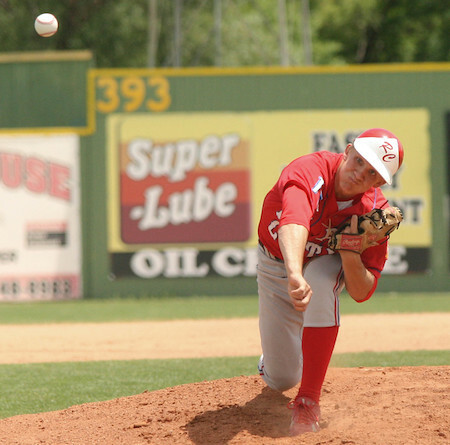 Pitchers are finicky creatures, and are nearly as superstitious about things involving their throwing motions as position players are their bats. Whether or not it was actually true, countless pitchers would probably FEEL (or claim to feel) as if the helmet was heavier than an ordinary cap, and that it was somehow affecting their windups. All those differnt jerseys! When I was playing Legion ball we wore t-shirts with the Post number on the front. Times change. Love’d the lede today. Nice interview. They seem to be from different years. Since the subject mentions changing helmet suppliers and that the new helmets have vents, I assume the apparently non-vented helmets with the brush-script RC logos are older uniform sets. The matte red helmets with vents would be newer, maybe current, uniforms. And goodness, what a terrific RC logo the new helmets have! I’m with you Bob. We used to have t-shirts and white baseball pants. And, of course, green stirrups! The two competing Colorado logos take design cues from Obama’s campaign logo. Fascinating interview, Paul. I hope MLB front office people read it. I wonder if the skullie type helmet has ever been tried with pro players or everyone just assumed it would not work for whatever reason? Is it just me or do those guys in the American Legion photos all look like Jon Olerud? I know the Orioles ’60s socks were mentioned already, but I’m not sure if it’s been mentioned that David Lough was wearing black sanitaries with his on Saturday. not much ticker material today… on a MONDAY? after a weekend? surprising. This hardhats story is really interesting. In this age where entire leagues are contracted to wear the exact same brand of anything visible there is becoming less room for these team-wide uniform quirks. It’s awesome to read instances where tradition trumps all. I’m trying to think of other ‘against the grain’ team-wide uniform traditions. I’m thinking Ottawa 67s barber pole striping, U-Mich hockey’s winged football style painted helmets (though it’s now mimicked by Notre Dame, tOSU, and Penn State). Perhaps white shoes for the A’s, though it’s kind of watered down with the modern cleat. The Detroit red wings have several years of putting their captaincy patches on the opposite side of the chest as everyone else. Still those aren’t as wild as this American Legion team wearing an entirely different piece of equipment. Speaking of John Olerud, he was a pretty good pitcher in college. When he turned pro he had to decide whether to be a full time pitcher or a hitter. In college Ulerud wore a helmet while pitching. What a miss by the Rockies. The time on the clock on the patch should have read 4:20! I was wondering if they wore flapped helmets while hitting. He says, “Each kid gets his own and they just throw IT in their bag.” [emphasis mine] This would seem to indicate to me that they wear the skullies while batting as well, which I would think would be more dangerous. More likely, the team has a set of batting helmets that are stored and transported by the team. Since each player has only one fielding helmet and transports it in his own gear bag, the fielding helmets don’t add to the team’s logistical burden for road games. That’s what I figure as well. Love the O’s stirrups and those College of Charleston throwbacks are awesome! LOVE the lace-up fronts! I found a place on ebay that sells all sorts of stirrups and I have a pair like the O’s but they are crimson colored on the top, black on the bottom and grey stripes. Loved your story. Took me back to my high school playing days at Tahoma High School in Maple Valley, Washington. We all wore the helmets between 1986 and 1988 (when the attached pic was taken), and I want to say that they were worn as early as the late 70’s as well. Except for, ironically, the pitchers. If I remember correctly, I think there was an issue with the chance of glare throwing off the hitters. But for the rest of us, they were definitely worn with safety in mind. With today’s matte finishes, though? Seems like a great solution for pitcher safety!! Just my opinion, but the A’s vs Astro’s, Yellow vs Orange matchup just looks dumb. What the hell is a colorblind guy suppose to do? Look at the pants, I guess, since teams always wear white or gray pants these days. If I were a pitcher, I’d at least give the helmet a try. Maybe in the bullpen to get used to it before trying it in a game. Also, are designs on the hockey style catchers mask not allowed anymore? I remember in the early to mid 2000’s John Flaherty of the Yankees had a mask with pinstripes and an interlocking NY on it. Now I only see generic one or two color masks. Thanks for following up on this Paul! I’m actually not even from Rapid City but I went there to play basketball in college. When you get there you learn about Mount Rushmore, the Black Hills, and Post 22 and their hardhats. Definitely something the city is very proud of. I wish Ellis or a few of the other Post 22 players that have played pro would have introduced it to the league (they might have even tried) but if you’re a pitcher I don’t know why you wouldn’t give it a try. Especially after watching Bradley get hit last night. The helmet wouldn’t have protected his cheek but it would have at least given him the option to try to duck into it and take it in the hardhat as opposed to trying to lean back and taking it in the jaw. Thanks again for following up, love seeing South Dakota get some love!